Welcome! This is where you’ll find everything you need to know about a career as an Army veterinarian. I’ve been on active duty as a Veterinary Corps Officer in the U.S. Army for over four years, and I love sharing about my experiences with others who are considering this weighty commitment. It’s not for everyone, that’s for sure. But this opportunity to serve my country while practicing my skills as a veterinarian has given me an incredible variety of unique opportunities. I also now have the financial freedom to make future job choices with a lot more flexibility than I would have otherwise had. We’ll start off with some of the writing I’m most proud of that I have published elsewhere, including my short story and an essay in the New York Times. 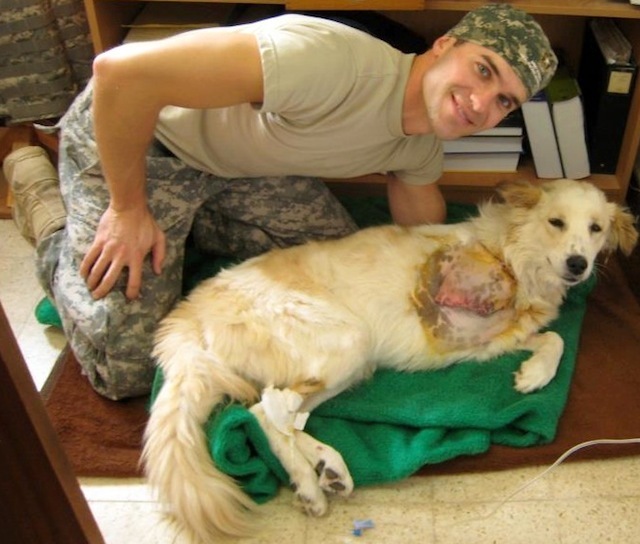 Then I’ll guide you through the series of articles I’ve written for my site that document my experiences applying for the scholarship program in veterinary school and working as a veterinarian in the military. Finally, I’ll link you over to my Frequently Asked Questions page, where I’ve edited many of my responses to your individual questions about life and work as an Army veterinarian. I recently published my short story, No Dog Left Behind. It’s been a lot of fun to see the reviews pop up on Amazon and Goodreads, and to know that maybe I do have the chance of making it as a “real” author one day! You can find a free preview of the story by clicking on the cover image on the Amazon page. I wrote an essay about the combat death of one of my military working dogs for the New York Times. You can see more pictures and read an excerpt in this blog post I wrote about it. Army Veterinarian: Do You Have What it Takes? I wrote an article for About.com that provides a great summary of my work as a veterinarian and active duty officer in the U.S. Army. Army Veterinarian Part 1: Let’s Start at the Very Beginning: Have you wondered about what it would be like to be a veterinarian in the Army? If so, I think you’ll enjoy this first part in a series on my experiences as an Army veterinarian. Army Veterinarian Part 2: Applying for the Health Professions Scholarship Program: Learn all about my experiences applying for the HPSP scholarship. Army Veterinarian Part 3: The Decision to Commit: This is the 3rd article in a series describing my experiences as an Army veterinarian. Learn about how I made my final decision to accept the HPSP scholarship and about my commissioning ceremony. UVP 004: Food Safety and Army Reserves Veterinarian Dr. Romina Hennig: In this podcast episode I interview Dr. Romina Hennig, a recent veterinary graduate who is working full-time with the federal government’s Food Safety & Inspection Service (FSIS) while also serving in the U.S. Army Reserves. You can also browse through a lot more blog posts I’ve written that deal somewhat peripherally with my career as an Army veterinarian. I’ve enjoyed corresponding with many of you about your specific questions regarding service as a veterinarian in the Army. Now I’ve collected some of the most common questions along with my responses in this new FAQ page. Check it out!